When animator Nyk Petta was given a class assignment to write a script about a main character being captured by an evil doctor, she invented the stars of her cartoon series, The Adventures of Dr. Blah-kman and Mr. Meow, which she’s been working on since 2008. Mr. Meow is a grey cat that was used as a lab rat by his mad scientist owner. Dr. Blah-kman is a half-parrot, half-man mad scientist who steals a mad science laboratory, and consequently Mr. Meow, from the previous owner in the series’ pilot episode. “I think this series will add a fresh telling of a well-known tale. It’s The Odd Couple meets Liquid Television,” Petta, of Truncheon M Productions in Texas, wrote to the Other Press. She created the cartoon while pursuing her Bachelor of Fine Arts in Media Arts and Animation. Now with her degree and a few years of experience as an animator, visual effects artist, and voice actor, Petta is ready to revamp the original pilot episode she made. She plans to improve the graphics, adjust the shots, and lengthen the script. “I’m anxious to get the re-imagined pilot out into the world so people can see how much potential this series really has,” she wrote. In order to produce a high-quality version of The Adventures of Dr. Blah-kman and Mr. Meow, Petta put the project on Kickstarter to fund the series, as well as fund Mr. Meow merchandise. The campaign rewards for project backers included Mr. Meow plush toys, T-shirts, tote bags, mugs, signed sketches, and more. 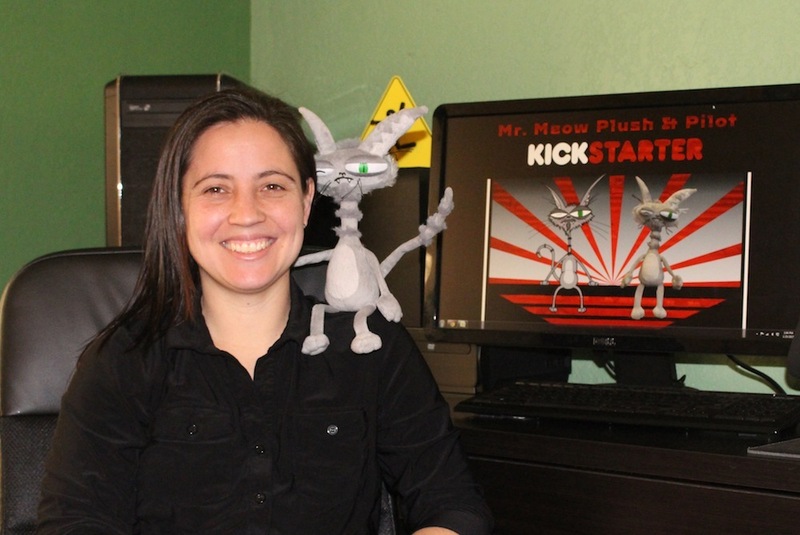 There were even some exclusive rewards, such as the opportunity to create a character for the series with Petta for a pledge of $1,000, as well as the opportunity to have lunch with Petta and receive a Mr. Meow plush in person for a pledge of $5,000. The campaign finished on January 31, reaching the funding goal of $11,500 in the final hours of the 30-day campaign. The next step for Petta is to have the rewards made and shipped, and then it’s onto the reanimation process for the pilot episode of The Adventures of Dr. Blah-kman and Mr. Meow. She will also be selling her Mr. Meow merchandise at conventions in Texas this year, with the hope of expanding to a national convention tour over the next two years. Petta also plans to create merchandise with other characters in the series, including Wicked Pickle and Pete the Carrot.